What does giving UP look like? Is it quitting? Is it going to bed? Is it throwing something? Does giving up have any feelings to it? Is it something that we do consciously? Is it something I can control? Is it something I can turn off or on? Is it something that hurts? Is it something that goes away? Giving UP is all of the above and much more. It is the feeling that whatever is happening has become too much: too much to do, too much to face, too much to feel. It is the feeling that no matter what I do I will fail. I can’t possibly accomplish whatever I set out to do or what someone else has asked me to do. Giving UP is the feeling that life has put too many bumps in front of me and that it just isn’t worth it anymore. The feelings that go with giving UP are tough to face. They are feelings of failure, loss, anger, frustration, sadness and much more. It is the worst, not the best in wanting to give UP, to quit, to walk away, to not face the bumps, the lumps, the pain or failure. Giving UP creates the feelings that often send people in the wrong direction: doing drugs, drinking too much alcohol, eating too much food, eating too much chocolate, watching too much TV, becoming a computer addict, a workaholic, etc. These are bad coping skills. The skills that lead to giving UP are not the skills that lead to a happier life. Giving UP leads to depression, sadness, loss, injury and unhappiness. Switching gears to NOT giving UP means having to add the NOT. Moving forward to finding ways to making things happen. NOT giving UP is meaning one has to push harder at finding ways to make things work. If I choose NOT to give UP I need to be creative and look for ways to succeed. Sometimes it is brainstorming alone or with others to find new paths to travel. Sometimes it means having to give UP the things that have kept me from succeeding. We often create a self-fulfilling prophecy where we set ourselves up to fail. We don’t believe that we can do it so we find excuses, reasons & other people to blame rather than looking to find a way to face the challenges. Changing that to a self-fulfilling prophecy of gain is the other side of the coin. If I switch gears I can start looking for ways to make things work, to make things possible, to make things happen. That doesn’t mean that I will always succeed or make things happen if I do it, but I do have a better chance of making it happen. 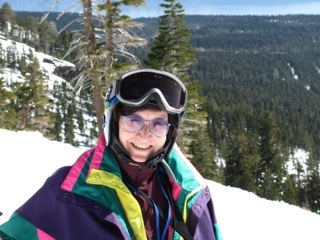 I am on my annual ski trip to Lake Tahoe where I ski with the Disabled Sports USA Far West. I called the director who has become a friend over the 25 years I have gone to the program and in tears I told him I was coming to Lake Tahoe and I can't ski. I had to cancel my lessons. It was the toughest decision of my life regarding my vacations. In 51 years I have never gone on a ski trip knowing that I couldn't ski. Every year is highlighted knowing I will have my one week to ski. I live to ski. I have had a broken ankle since November, 2 weeks before having breast reduction surgery to help heal my back problems caused by the disease that has been with me for 27 years. My left breast developed a 2-inch hole, which took 2 months to heal. The ankle hasn't. The disease that I have is called eosinophilia myalgia syndrome. (For more information, visit http://www.nemsn.org/. ) My X, our son and I were victims of the L-tryptophan poisoning in the late 80’s where 20,000 people were affected. It is considered the first genetically modified disease similar in which the whole body was toxically poisoned. I was pregnant at the time and my son was born with the disease. The US government wiped our disease off the books in 1996 hoping to hide what occurred. It is the same as Agent Orange. I left PA with well wishes from all my patients who knew I was in excruciating pain and couldn't walk on my left foot. I told them this was an example of making lemonade out of lemons. I was going to go and face my sadness with lemonade. I used wheel chairs for the flights and had a really bad incident with Circus Circus sending me with 40 lbs. of luggage the wrong way for my room ending up in a wheel chair for that day. I was really questioning my own judgment. Today, I am soooooooo happy I faced the challenges and came. I am swimming, healing, doing computer work, writing this article, having meals with friends I have made here, going to a movie which I haven't done in about 10 years with a friend and spending my birthday with a friend I met last year. The disabled ski school friends have given me lots of hugs and hopes for next year. They were clear I needed to visit them, which I did and will do again on Thursday with treats to celebrate my birthday. This is so important in tackling the demons that keep us from functioning. The benefit of it is I will be going back to my patients with wonderful stories of how I not only survived, but also thrived. NOT giving UP saved the ski trip! NOT giving UP can lead to success. We need to take small steps to get to that better place. It means learning better coping skills, ways to turn the imagery to positive thoughts. Doing yoga, exercising, eating healthy and keeping the body healthy. It means finding ways to make ourselves feel better; not doing things that will harm us in the end. It means having to pull ourselves up when we feel down and depressed and reaching out to others to get help when we need it. I know for myself it took about 10 years before I finally asked the doctor for a Handicap placard. It felt like being a failure. I would no longer be doing things like everyone else. Today I proudly put my Handicap placard up, ask for help and admit I don’t want to do it alone. I want the support of others. I want help and becoming successful at getting to my goals with and without help. 1. Take the negative thought(s), write them on a piece of paper, crumble it up and throw it as far as you can. 2. Use the Stop & Think tool. Stop & Think, decide if it is a good choice or a bad choice and then focus on what you can do to make it a good choice. 3. Write all the reasons you feel are reasonable to give UP. 4. Write all the reasons to NOT give UP. 5. Write a letter to someone you know cares about you. You can mail or not mail it. 6. Take a nice hot bath & think about what you can do in the situation you are in. 7. Do your yoga and if you aren’t sign up for a class. Use that time to recharge. 9. Do 15 minutes of exercise, whatever you can do. 10. Affirmations: Look in the mirror & tell yourself 5 things you like about yourself & then what you can do. Dr. Julie Ann Allender has been a licensed psychologist in private practice since 1980. A native of Wood Dale, Illinois, Dr. Allender received her undergraduate degree in psychology from the University of Illinois in Champaign-Urbana. She received her M.Ed. and Ed.D. in Psychoeducational Processes (PEP) at Temple University in Philadelphia. PEP was a program that focused on group dynamics, organizational development and humanistic education. It was a pioneering program in humanistic education and psychology way before its time. Dr. Allender's education also included a two-year Graduate Student Professional Development Program (GSPDP) from NTL, National Training Laboratories, Institute in Bethel, Maine. She had a private practice in Lebanon, Pennsylvania for the past 20 years. Dr. Allender has been an adjunct faculty member at numerous universities and colleges including: Temple University, Philadelphia College of Textile and Science, Thomas Jefferson University and the Pennsylvania State University. She is a staff consultant to The Good Samaritan Hospital in Lebanon, PA & Specified Professional Personnel in Psychology at Abington Hospital in Lansdale, PA. Dr. Allender is the author of two books: End of My Rope - Gender Cooperation Model and Chronic Illness: Healing the Wounded Heart, a contributor in 20 Active Training Programs by Mel Silberman and co-authored a parent/teacher/student school program Kid Concerns. She has been published widely in professional journals. She has also produced a deck of 54 Motivation Cards to help people get through the day.